This is the second of three lessons about Noah. You can view the first lesson in the series here! 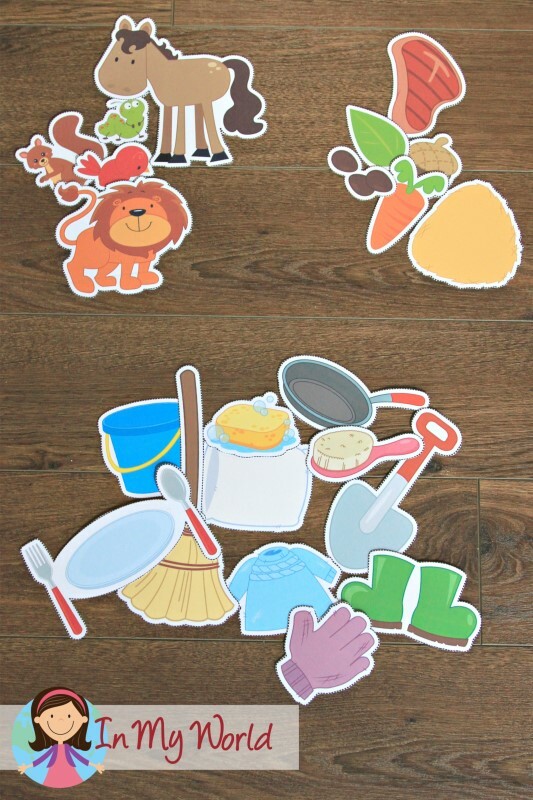 We started the lesson by asking, “What did God tell Noah to do?” This got our kiddos thinking about what we had learnt last week and, sure enough, they remembered that God had told Noah that He will send a great flood over the world and that Noah needs to build an ark to save himself, his family and many animals. We talked about how some of Noah’s friends and neighbours teased him and thought he was very silly for building such a big boat. However, Noah didn’t listen to them and continued to trust in God; Noah knew it was much more important to listen to God than to listen to what people say. That is why he didn’t let the words of his neighbours and friends upset him and he continued to build the ark. We emphasised how important it is to always trust God, even when the people around us think we are silly. 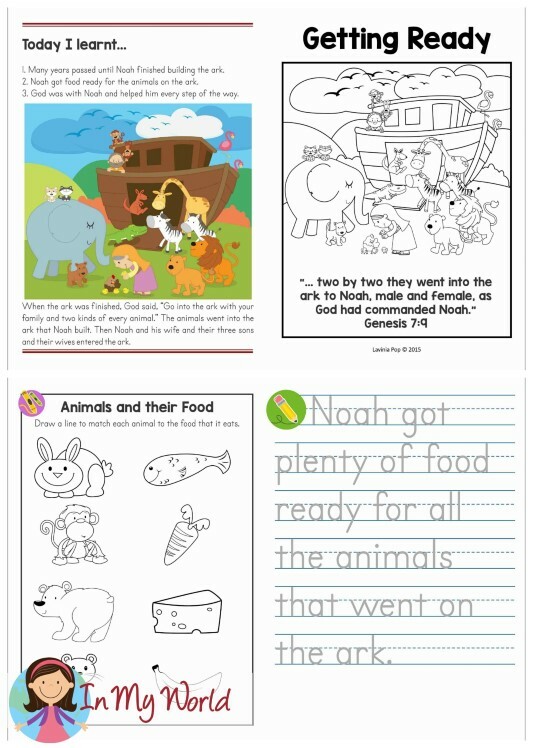 Because there were going to be many animals on the ark, Noah had to gather the different types of food each animal ate. We gave each child a picture of an animal and we placed a food item on the board. The child who had the picture of the animal who ate that food had to come to the board and place it next to to food. The kids had a lot of fun with this activity. Once Noah had finished getting everything ready, it was time to get all the animals on the ark. 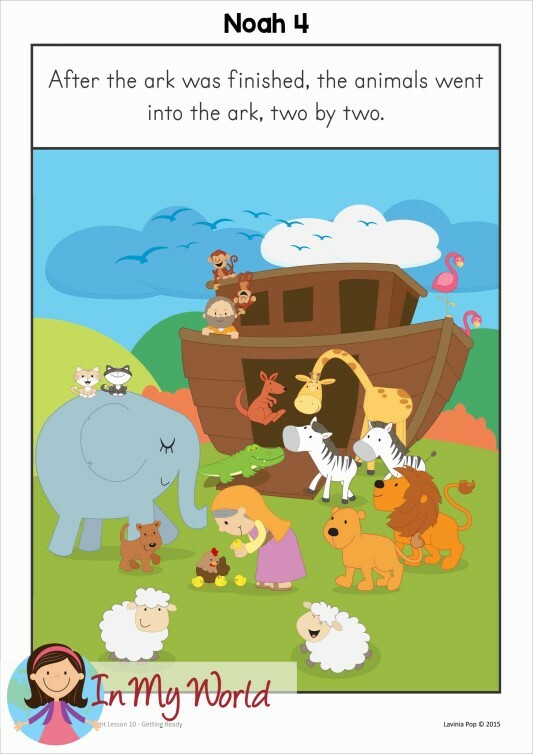 We made a big deal out of saying that Noah didn’t have to go out to get the animals… Our kiddos may be small, but they understand how hard it is to round up so many different animals and convince them to board the ark! So, when we told them that God sent the animals to the ark, they were thrilled! It was good for them to see that when God has a plan for them, He is involved every step of the way! We finished the lesson here, but promised we would find out what happens to Noah and all the animals next week! To help our kiddos remember what we learnt this week, we made an ark out of paper plates with different animals stuck onto some icy-pole sticks. And, of course, we gave them each a booklet to take home. Please click here to download the story aids, tools, craft and take home book in English. Love your works. Praise the Lord. I absolutely love your resources and I would love to see lesson 3 to this series. Thank you ever so much. I’m hoping the pre-school kids will love this craft. Buna! Ma intereseaza si pe mine forma aceea de corabie de pe farfurie. Mi-ar trebui sambata viitoare la studiul biblic. If anyone is still looking for the 3rd Noah’s Ark lesson, it’s in the blog archives for October 2017. I love these lessons! I’ll be using it for 1st graders.